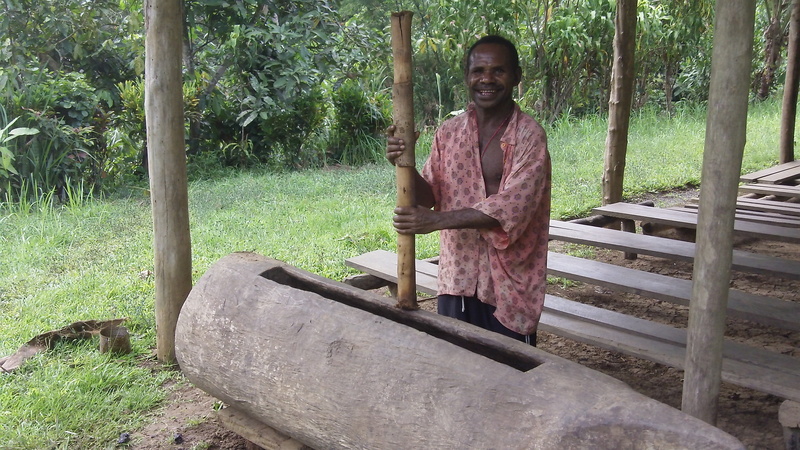 The garamut is a slit gong made out of wood. 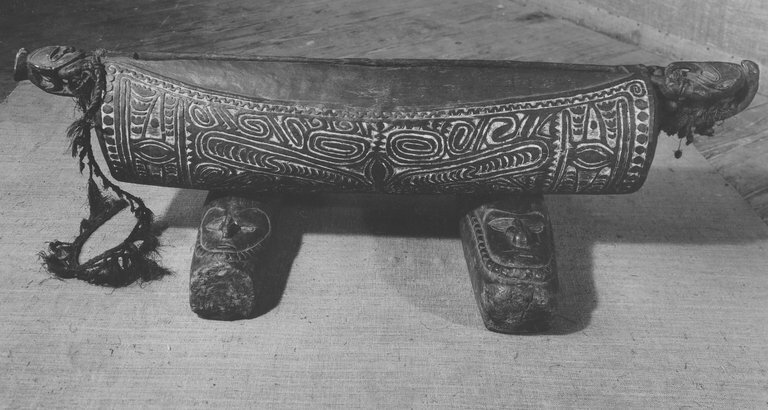 The instrument is widely used in Melanesian cultures. Garamuts are used for traditional dancing and performances. It is also used to call and gather. Communities used the garamut to call meetings, call school children to classrooms and congregations to churches. Picture by Pioneer Bible Translators. Calling his congregation to church; one of the most common uses of garamuts. In Papua New Guinea the instrument, depends on its size and how shallow the slit is, gives a distinctive sound. It can also be played very rhythmically and the sounds makes you want to dance. A garamut in Brooklyn Museum. In the first video clip, I am delighted to show my own people dancing the siak, a slow motion dance in Salamaua, Morobe Province. A single and sometimes two garamuts would lead the siak accompanying kundu drums. Pay attention to the sound of the garamut – the largest wooden instrument in background. The second video below is from Manus Province. For their performances, Manus dancing requires a collection of garamuts of various sizes and played together. The biggest drum (deepest) leads the rhythm and song. Dear Lisa, it was lovely to see you on my blog and awfully kind of you to nominate me for this award – thank you very much. I see you are a friend of friends of mine, which makes you a friend already. 🙂 I had a quick visit to your blog and I love the way you speak your mind; I will follow you too. Thank you again. I appreciate the love my new friend. I am happy you liked what you read over here. I enjoyed reading your blog, hence the award. I hope you will return and be sure to stay in contact. Thankyou Joycelin. I grew up in Madang and hearing the sounds of the garamut once again warmed my heart and made me very nostalgic.